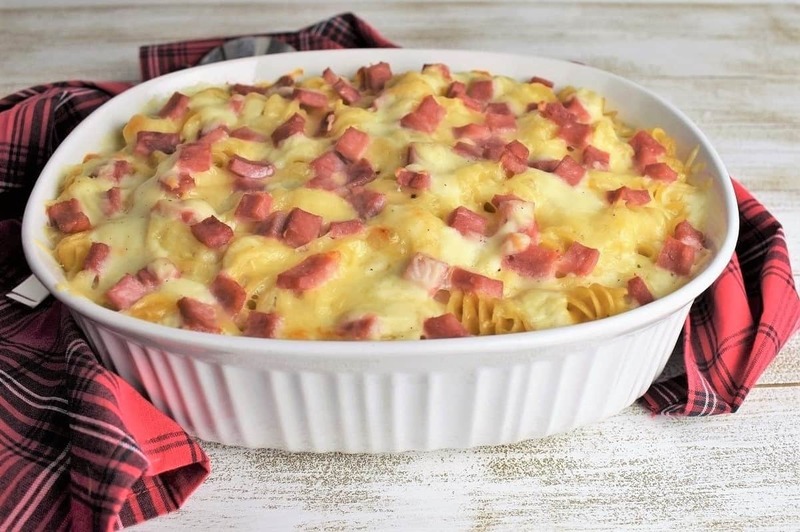 This ham and cheese pasta bake is an easy, delicious, comfort meal that’s fit for holiday get-togethers or Sunday dinner. 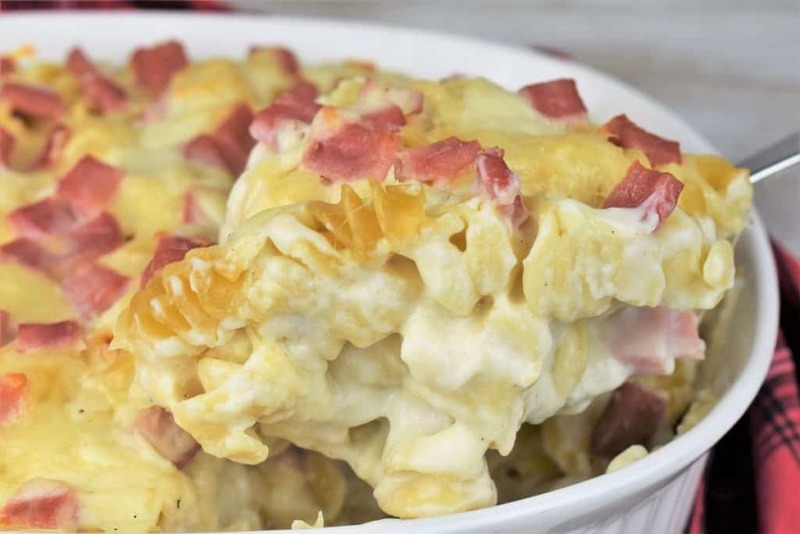 In this recipe, rotelle pasta is covered with a creamy béchamel sauce, Swiss cheese and diced ham. This pasta dish uses simple ingredients, and requires minimal prep, plus it makes a nice big casserole so it feeds a crowd. For more great pasta dishes, try this blackened shrimp & creamy pasta or this penne and vodka sauce. Enjoy! A béchamel, also called a white sauce, is one of the five mother sauces of French cuisine. It’s a simple (but magical) combination of butter, flour and milk. The butter and flour make a roux, and then the milk is added and simmered until thickened. A béchamel is usually flavored with nutmeg, salt, pepper (white or black) and a bay leaf. 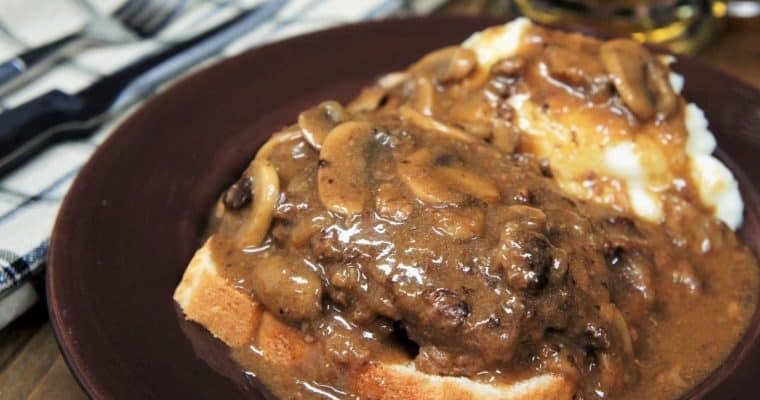 It has a creamy, nutty flavor and a smooth texture. On its own, a béchamel doesn’t necessarily shine. Like you won’t think to yourself, hmmm… you know what I can go for right now? Some béchamel. But, when combined or added to other ingredients, a béchamel sauce can take an ordinary dish and turn it into something spectacular. A béchamel goes great with cheese. In fact when cheese is added, it makes a different sauce altogether – a Mornay Sauce. In this ham and cheese pasta we use a béchamel and cheese but we don’t combine them. Instead we layer the pasta, sauce, cheese and ham to create a distinct and delicious flavor combination. 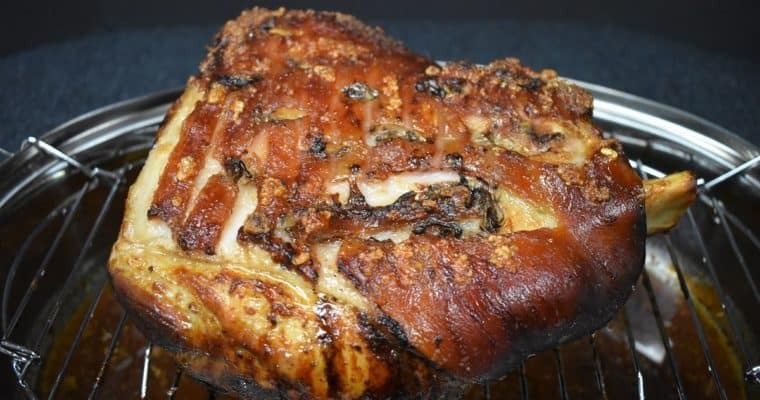 Choose a ham that is pretty strong and not sweet. We used a ham steak, then sliced it into ¼ inch slices then into ½ inch pieces. As long as they’re bite sized pieces they’ll work. Shred the cheese and measure out the butter, flour and the spices. The 1½ teaspoon of salt, black pepper and nutmeg will go into the sauce at the same time so put them in the same bowl. Warm the milk, in the microwave or on the stovetop. We have used whole milk and reduced fat milk to make a béchamel. We’ve never used skim milk, I think it’s too thin and too watery. Everything moves really fast when making the béchamel sauce. Plus all your attention needs be on the sauce; it’s very important to never leave milk on the heat unattended. Have everything ready to go for this recipe before starting to cook. Start a large pot of water over high heat. Melt the butter in a large saucepan over medium heat. When the butter is melted add the flour. Whisk the butter and flour until well combined and smooth. Cook the flour mixture for 2-3 minutes, stirring almost constantly. Slowly add the milk to the saucepan while stirring. Add the bay leaf. Gently bring the sauce to a simmer. It will take about 10-12 minutes. It will happen. Don’t crank the heat. Stir the béchamel occasionally to keep it from sticking and burning on the bottom. Add the salt, pepper and nutmeg to the sauce, stir to combine well. Cook the béchamel for about 5 minutes keeping it at a gentle simmer (lower the heat if needed) stir frequently. The sauce will thicken as it simmers it should be thick enough to coat the back of a spoon. Remove the bay leaf and discard. Taste the béchamel; add a little extra salt, if needed. Keep the sauce on low or warm until ready to use, stir occasionally. Once you have the sauce under control, drop the pasta and cook to package directions for al dente. Remember to salt the pasta water. Reserve about ½ cup of the pasta water and drain. Return the pasta to the pot and add the reserved pasta water, stir. Use a large baking dish or pan (about 9X12, make sure the dish or pan is ovenproof). Add half of the pasta to the casserole dish. Add about half of the béchamel sauce over the pasta. Sprinkle half of the grated Swiss cheese and half the diced ham. Add the remaining pasta, the rest of the béchamel sauce and top the casserole with the remaining cheese and ham. Reserve just a few tablespoons of the béchamel to top the pasta, for garnish. 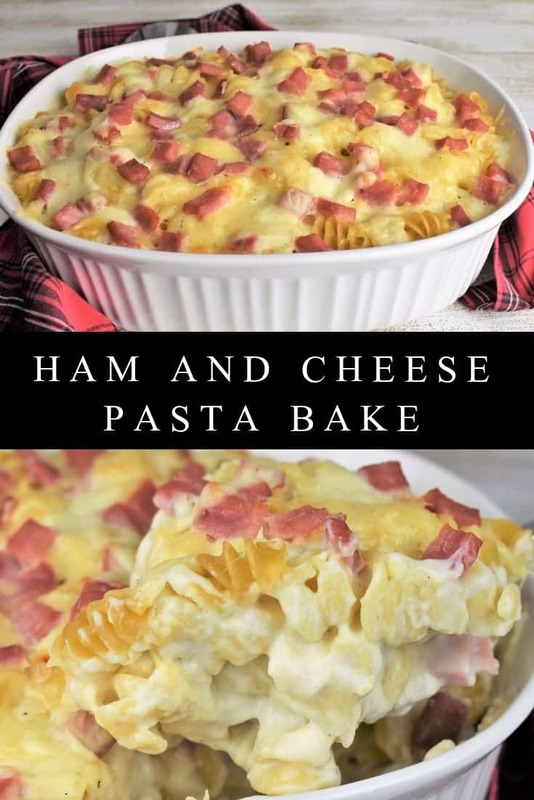 Bake the ham and cheese pasta for 30-35 minutes, until the sauce is bubbly and some of the ham pieces start to toast a little. 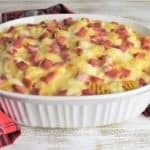 This ham and cheese pasta bake is an easy, delicious, comfort meal that’s fit for holiday get-togethers or Sunday dinner. Slowly add the milk to the saucepan while stirring. Add the bay leaf. Gently bring the sauce to a simmer. It will take about 10-12 minutes. Stir occasionally to keep it from sticking and burning on the bottom. Add the salt, pepper and nutmeg to the sauce, stir to combine well. Cook the béchamel for about 5 minutes keeping it at a gentle simmer (lower the heat if needed) stir frequently. Once you have the sauce under control, Salt the pasta water and drop the pasta. Cook to package directions for al dente. Reserve about ½ cup of the pasta water and drain. Return the pasta to the pot and add the reserved pasta water, stir. Use a large baking dish or pan (about 9X12, make sure the dish or pan is ovenproof). Add half of the pasta to the casserole dish. Add about half of the béchamel sauce over the pasta. Sprinkle half of the grated Swiss cheese and half the diced ham. Add the remaining pasta, the rest of the béchamel sauce and top the casserole with the remaining cheese and ham. Reserve just a few tablespoons of the béchamel to top the pasta, for garnish if desired. Warm the milk, in the microwave or on the stovetop. Use whole milk or reduced fat milk to make a béchamel.